Goalkeeper Tim Howard of the U.S., left, makes a save during the World Cup Round of 16 match between Belgium and the U.S. in Salvador, Brazil, on Tuesday. After losing 2-1 to Belgium on Tuesday, the U.S. men’s national team will be left to contemplate its future; after years of steady improvement, there are hints U.S. men’s soccer has hit a plateau. But one American left the tournament with a strong argument for his international quality: Goalkeeper Tim Howard. Howard was FIFA’s Man of the Match despite conceding Belgium’s two goals — both in extra time. The award is deserved. 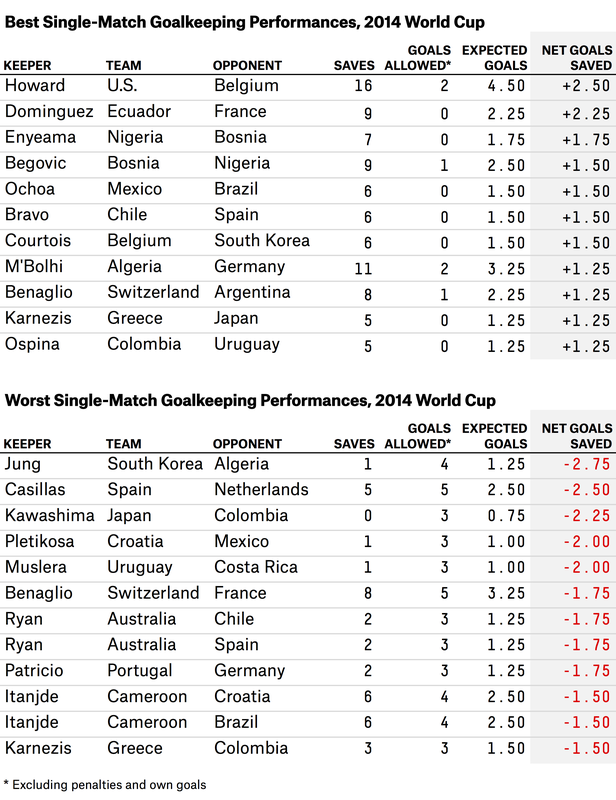 In fact, Howard’s game probably was the best by a goalkeeper in the World Cup to date. Howard faced 18 shots from Belgium by this definition. If 25 percent of shots score on average, that implies Belgium would typically score 4.5 goals on this shooting volume. Instead, Howard conceded two goals. That means he saved a net of 2.5 goals for the United States. 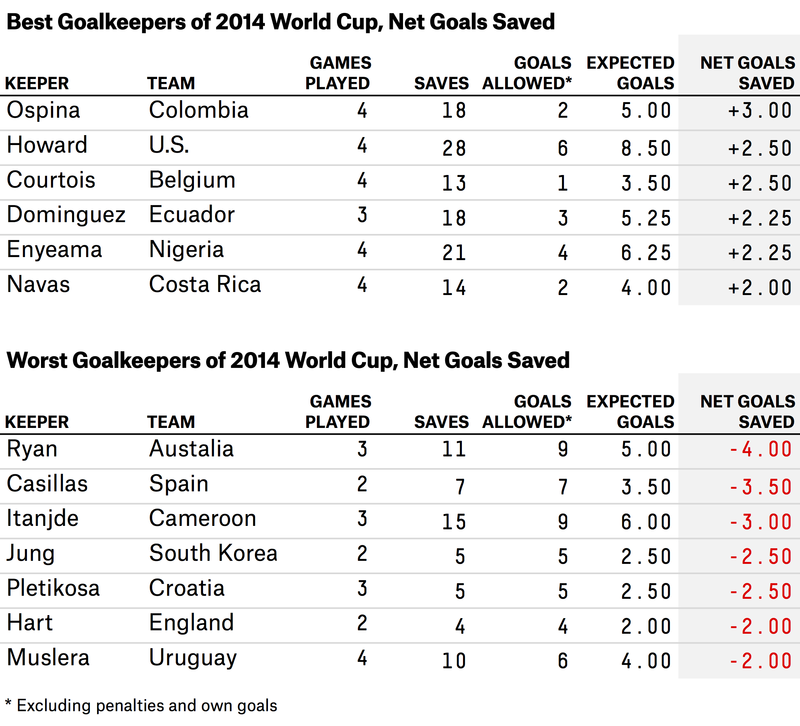 That +2.5 score — which we’ll call Howard’s “net goals saved” — was the best single-game performance in Brazil so far. The second-best belongs to Ecuador’s Alexander Dominguez, who made nine saves and allowed no goals against France for +2.25 net goals saved. That’s pretty good but slightly behind Howard’s total; Howard’s seven extra saves slightly outweighed the two goals he let in. The worst single-game performance belongs to Jung Sung-ryong of South Korea, who allowed four goals and made just one save in a poor performance against Algeria — a net goals saved score of -2.75. Spain’s Iker Casillas was nearly as bad in conceding five goals against the Netherlands, but he at least made five saves to go with them. Howard has not quite had the best overall tournament, however, because his net goals saved was exactly average (+0.00) entering the Belgian match. Instead, that honor goes to Colombia’s David Ospina, who has made 18 saves and allowed just two goals in four games so far, for a net goals saved of +3.00.